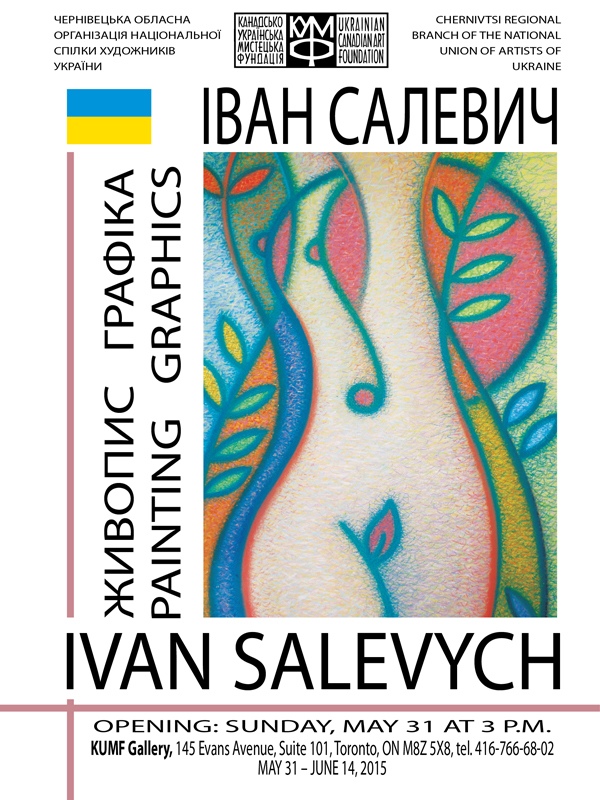 Ivan Salevych was born on August 6, 1960 in the Zalishchnyky region of Ukraine, in the village of Kostilnyky, which is now called Vynohradne. In 1981, after completing studies in the School of Applied Arts in Vyzhnyci in the Chernihiv oblast, he went on to study in the Moscow Advanced School of Artistic and Industrial Design, where he took part in several youth exhibits of small plastic works. Since 1987 Ivan has lived in the city of Chernivtsi working with various types of sculptures; metals, plastics, ceramics, bronze and wood. He is equally skilled in techniques of graphics, monotypes, pastels, water colors, oil painting and mixed media. He also creates installations. In 1988 he took part in a symposium in the City of Sedniv, which inspired his personal exhibit of “A Triptych” in his native Chernivtsi. In 1990 he was accepted into the Union of Artists of Ukraine, thus he began to take a more active part in all-Ukrainian and international exhibits with personal one-man shows; in Kamianets Podilsky, Ivano Frankivsk, Rivne, and Suchava in Rumania. Other projects in which Salevych took part were an international project called “Meridian of the Heart” in 1998, a Tri-Annual Sculpture exhibit in Kyiv in 1999, as well as the International Symposium of Monument Ceramics in the historic town of Opishnia, in the Poltava oblast in 2000. This prolific artist’s works are preserved in museums and private collections in Ukraine and elsewhere. His sculptures and paintings can be seen in personal and group exhibits. Besides this main work, he occasionally finds time to write songs, ballads and poems. These also speak of him as a true artist, a person of great creativity.